Confession: I've never seen Ocean's Eleven, but I like crime/spy thriller movies. Confession #2: I'm a bit of an X-Men geek; that is, I watched all of three or four cartoon adaptations and all the movies. 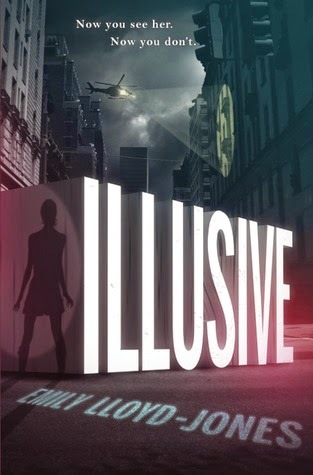 So when the publisher pitched Illusive as "X-Men meets Ocean's Eleven," they hit a home run. I would definitely pick this book up. So I did. It didn't wow me the way I hoped, but it's entertaining. I like the world. I like how it incorporates super powers while still taking place in the real world. I also really like the criminal element. Super powers and crime go together here much like Holly Black's Curse Workers series, and it's a good fit. Ciere, despite her impulsive and less than well thought out decisions, is a good main character. She's likable enough, and there's plenty of room for growth. I'm curious about this previous work/team Kit and Magnus and Aristeus were involved in. It's kind of sounding like a super secret Navy Seal-like paramilitary mutant organization. I loved some of the super dry humor inserts (often used to end scenes). Example: "There is nothing funny about this.\ Devon drank the drugged coffee. \ Perhaps there is." I think Brandt Guntram and Conrad are going to be TONS of fun in future installments. They are the kind of fun, sarcastic, violent mobsters you love. I really hope we keep them around. I wish we'd spent more time with Daniel, the other main POV. I know, intellectually, there isn't a ton going on around him most of the time- just lots of watching and waiting with the feds, but I liked his voice/sarcasm and would have liked more of that humor. The bad guy is good at the beginning, but falls a bit flat for me by the end. I think the author is trying to make him more complex, show us that he's more than a "bad guy," but the shift from one extreme to the other was too jarring for me. It was like he went from the craziest, most fanatical Magneto straight to peace-loving, let-me-give-your-life-purpose Xavier. I was not a big fan of the "instant connection" between Ciere and the boy that pops up two thirds into the story (the Last-Minute Boy). It's too much, too fast, especially for two suspicious little teenagers, one of whom is a professional criminal. Minor spoiler: I liked the "connection" even less when it led to ditching the best friend, which was loser-ish and seemed contrived just to get him out of the way for future books. YES THANK YOU! I read this one a while ago and man, Kel, I was so frustrated with the instant connection between Cierre and "last minute boy" as well as the feeling that we should root for him. No. Just no. I'm glad I'm not the only one! I hoped they would send Last-Minute Boy off into the world at the end and start Book 2 fresh without him, but they didn't. And the reason for keeping him around was so ridiculous. I kind of hope he's killed off early in Book 2 because my opinion of Ciere seems to plummet the longer she's around him. My interest is PEAKED! Checking my library for this one right now! PS (of sorts) I love your reviews. Could I copy your style? If you review a Netgalley selection, do you submit the review in this format, or do you write out a more 'formal' review? Thanks Kel!!! I hope you like it! It really is an interesting setup and there's plenty of potential for the series. And thank you! You are welcome to copy my style/format, though I can't take all the credit. I was heavily inspired when I started blogging by Anya at On Starships and Dragonwings. And yes, I keep my reviews in this format when I submit to NetGalley and Edelweiss.